Last year, upscale dining spot Cork revamped its décor and menu. Co-owner Danielle Morris, Executive Pastry Chef and restauranteur, wanted to appeal to a regular clientele, not just a special occasion crowd, and re-opened it as Earnest. Recently I was invited to try the new menu, and made a reservation for my first visit. “Comfort food, redefined” is the tagline and the atmosphere befits this description with clean-lined wood furniture, dark colors, a chalkboard wall, and a striking wine case. Warmly welcomed by the affable General Manager, Winston de la Cruz, we are seated at a cozy banquette and table awash with the warm light of the setting sun. “Would you like to start with bubbly?” asks Scott, our wise waiter. We’ll soon find out he has many more smart decisions in store as we are treated to the dishes, wine pairings, and cocktails to come. Former sous chef Sean Williamson is now the Executive Chef and while he has kept many menu favorites, he has also added his own, such as the excellent country pate. The effervescence of the sparkling wine cuts through the richness of the creamy chicken liver pate studded with chunks of bacon, making this a perfect beginning to our meal. Next, spinach salad elevated by the sweetness of apple and the textural crunch of corn nuts is crowned with a crispy soft-boiled egg, its yolk joining with the bacon vinaigrette to create the perfect dressing. After a palate cleanser of blood orange sorbet, we move on to equally delicious entrees. Scott pours a Spanish Garnacha as we savor a juicy double-cut pork chop garnished with whole grain mustard and applesauce and served on a bed of sausage and cheddar potatoes, and the Wednesday special, fantastic, perfectly-seasoned fried chicken in a crunchy, craggy crust served with asparagus and tempura avocado. The two sides change weekly, but I’d be happy to have that tempura avocado as a permanent addition. And how can we refuse dessert? Especially when it’s cinnamon bread pudding with caramel and crème fraiche ice cream strewn with colorful edible petals and a sophisticated crème brulee take on PB&J with pâté de fruit and honey-roasted peanuts, both paired with a glass of Tokaji. With Sean manning the bar, cocktails don’t disappoint either. We sip on well-crafted libations and try the Revival (a tequila cocktail), a rum Manhattan, Last Word (one of my favorite classics), and a decadent Espresso Martini to finish. A bonus was the opportunity to sit down with Chef Sean, Assistant Pastry Chef Alyssa, and Winston after the meal and learn more about this engaging group of talent. A friendly team, skillful chef, excellent cocktails, and perfect service. We’ll be back. I just wish they were in my neighborhood so I could be a regular. Especially on Wednesdays. Summer Specials at Earnest include Throwback Thursday featuring their most popular Cork (and Earnest) dishes. Also, children 12 and under eat free with the purchase of one adult entree (per child). 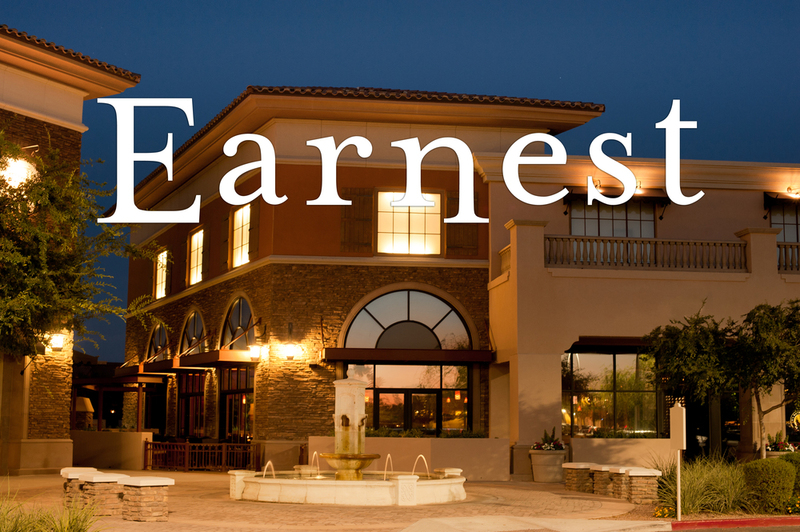 For Kids Menu and Throwback Thursday specials, view online at Earnest/events or call 480-883-3773 to make reservations.